An undated photo provided by the Philadelphia District Attorney's Office shows a procedure room at the Women's Medical Society in Philadelphia. An unlicensed medical school graduate delivered graphic testimony Thursday about the chaos at a Philadelphia clinic where he helped perform late-term abortions. Stephen Massof described how he snipped the spinal cords of babies, calling it, "literally a beheading. It is separating the brain from the body." He testified that at times, when women were given medicine to speed up their deliveries, "it would rain fetuses. Fetuses and blood all over the place." Massof, of Pittsburgh, is in prison after pleading guilty to third-degree murder in the deaths of two newborns. He is now testifying against his former boss, abortion provider Kermit Gosnell. 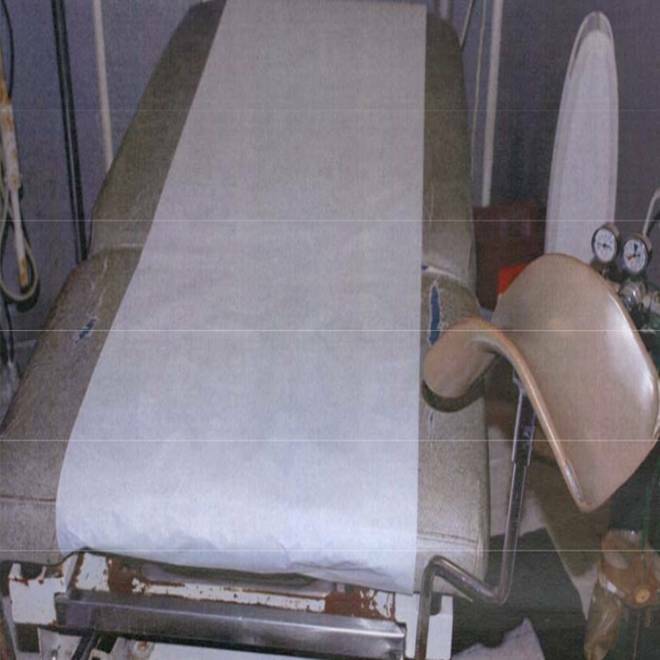 The 72-year-old Gosnell is charged with killing a woman patient and seven babies. Massof testified that his medical degree came from Granada in the West Indies and that he never completed a medical residency before he began working for Gosnell in the summer of 2003. He initially shadowed Gosnell and within two months, Massof said he was performing gynecological exams on his own. By law in Pennsylvania, after a woman's initial visit with an abortion provider, she must wait at least 24 hours and receive counseling before having the procedure. It is also illegal for doctors to perform abortions after a pregnancy has reached 24 weeks, unless the mother's life is at risk. Massof testified that he was involved in late-term abortion procedures at the clinic. He said the most extreme case that he witnessed was an abortion at 26 weeks. Massof performed ultrasounds and admitted that the clinic's ultrasound machine was manipulated to make fetuses appear smaller and therefore younger. Massof says Gosnell was often at his Delaware clinic while he oversaw women going through labor and even delivery. He says some patients were highly sedated or even unconscious, but were not monitored by any medical equipment.